Understanding an archaeological site is a process of interpreting contemporaneous archaeological horizons. On any archaeological site, the upper strata are later and the lower strata are earlier, because each layer must have either been deposited on top of or created by the removal of a pre-existing layer. That’s the basis of stratigraphy. The term stratigraphy is derived from geology and the law of superposition (which is what I’ve described above) and the analysis of stratigraphy have been transcribed to archaeology. An archaeologist must ascribe contexts (single units of stratigraphy) to each successive layer or deposit and try to interpret their relationships and sequence, thus enabling conclusions about the date and nature of the site and, through analysis, the sequence of events on site. Contexts can comprise of layers (defined surfaces etc. ), deposits (such as a deliberately filled in natural feature or a man-made feature such as a ditch or a pit), structures (walls) or, as in the example in the photo below, cuts (a cut is an event as opposed to having a tangible thickness – it is cut through and removes all, or part of, earlier levels/strata). The relationships between contexts must be understood and the chronological order in which they were created described. For example, in the photo above, the earliest context is the natural clay (C.8) – the context numbers I’m using here are used in order of discovery to mirror the on-site experience. The Cut for the grave occurred later (C.7). The temporal relationship of the human skeleton (C.6) with the cut is such that the skeleton is later in the sequence (you have to dig a grave before you put a burial in it). Similarly, the clay (C.5) which was backfilled into the grave cut is also ‘higher’ in the sequence of events. This is where the sheep comes in. You can see from the photo that the cut for the burial of the sheep removed earlier solid contexts in the human grave, such as the grave fill, the femur and other skeletal remains. 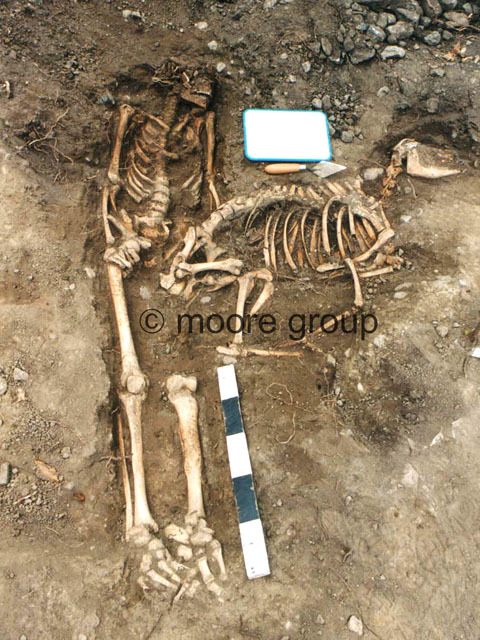 So, the sheep burial cut, (C.4) post-dates the human burial (in this case by 100’s of years). The skeleton of the sheep (C.3) post-dates the cut, the sheep burial fill (C.2) post dates the sheep skeleton and the later soil material (C.1) which covered over all the archaeology, post-dates both the human and sheep burials. This can then be presented using what is called a Harris Matrix, a two-dimensional representation of these relationships. Simple, really, and perhaps most importantly, the sheep and the human burial are not contemporaneous as might appear at first glance. Please note that all photos on this blog, unless stated otherwise are copyright of Moore Group. Please contact us if you wish to use any of the photos. This entry was posted on Friday, November 16th, 2007 at 12:44 pm. It is filed under About Archaeology, Resources and tagged with About Archaeology, burials, context, environmental consultants galway, galway, geology, grave, Ireland, photo, relationship, resource, sheep, skeleton, stratigraphy, superposition. You can follow any responses to this entry through the RSS 2.0 feed.